Some characters embody the absolute worst in human nature. They represent the most repugnant qualities in all of us. Sometimes, they do their job a bit too well and bring us face to face with things we’d rather not confront. These characters, and the films they inhabit, are often dismissed as dangerous and without a shred of socially redeeming value. On December 9th, 1983, one such character was born. He is a bit of an odd duck in the history of motion pictures, equal parts grim reality and bloated fantasy. 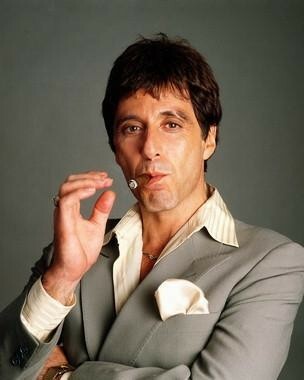 He would come to be as the main character in a big budget remake of the classic Howard Hawks gangster film Scarface. 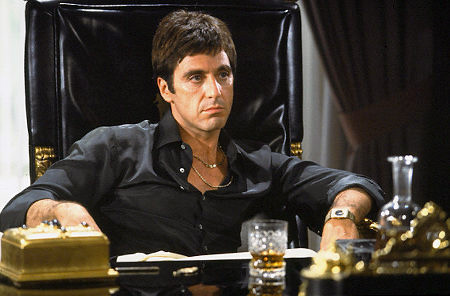 Scarface tells the story of Antonio Raimundo "Tony" Montana (Al Pacino), one of 125,000 displaced Cubans to arrive in Miami, Florida via the Mariel Boatlift. He is accompanied by his friend Manolo "Manny" Ribera (Steven Bauer). The two find themselves toiling away as dishwashers on the streets of the magic city. It’s the height of the “cocaine cowboys” era, and Tony looks at the prosperity enjoyed by local coke dealers with envious eyes. He and Manalo begin working for local cocaine kingpin Frank Lopez. The murderously ambitious Tony covets Frank’s girlfriend Elvira Hancock (Michelle Pfeiffer). This results in rift forming between the two, which ultimately leads to Tony killing Frank and acquiring all that was once his. He forms a lucrative working relationship with Bolivian cocaine baron Alejandro "Alex" Sosa, becoming a multimillionaire in the process. He also becomes hopelessly hooked on his own product, slowly morphing into a paranoid megalomaniac. As his empire crumbles around him, Tony responds the only way he knows how: with extreme violence. Scarface strictly adheres to the basic plot of the original. The screenplay by Oliver Stone, himself a drug addict at the time, had a basis in reality despite its sensationalist overtones. As Billy Corben’s excellent documentary Cocaine Cowboys would later show, the violence and excess of Tony Montana’s world were a fact of life for Miami’s cocaine kingpins during that time. Director Brian De Palma took Stones profane, bullet riddled screenplay and turned it into a Frankenstein’s monster of a gangster film. It was equal parts black comedy, soap opera, and spaghetti western. Though much of what transpires onscreen is completely within the bounds of reality, De Palma frames everything in insanely operatic terms. The violent moments have the exploitative flare of an Italian Giallo film. In the midst of a film that simultaneously dramatized and reveled in wretched excess was a bravura performance by star Al Pacino. His faux Cuban accent makes Ricky Ricardo’s look restrained by comparison. He plays every scene at a fever pitch, sneering and cursing through any and every situation thrown at him. The character has been denounced as irredeemably stereotypical and the performance as laughably overdone. Look just beneath the surface, however, and something else reveals itself. His gaudy style of dress, stereotypical dialect and mannerisms reflect his value system. He is the idolater that lurks inside all of us. He wasn’t so much corrupted by the American way of life as he was emancipated by it. He is the living embodiment of raw ambition in its ugliest form. He doesn’t simply indulge, he devours. No amount of money, power, or drugs could possibly be enough. Even after reaching the top, he isn’t satisfied. That jaded sense of dissatisfaction causes him to finally implode. In a nutshell, Tony is the total perversion of our collective aspirations. Scarface has become the very definition of an endearing cult classic. The Hip-Hop generation has embraced it as a fractured fable about the American Dream. However, its appeal is not limited to any particular race or subculture. Scarface irks the status quo not because of the supposedly inept execution, but because of its brutal honesty. Tony lives life as though he is a character in a grand play. He is a consummate narcissist, unable to see past his own desires. That is the unspoken truth of this character. The American power structure is fueled by worldviews every bit as corrupted and selfish as his. For proof, one only has to look at the current state of the economy. Just like Montana, the wealthiest one percent feel as though the world should be theirs.